Remember when I told you I was working with an illustrator? He’d draw something, I’d write the story? I’d write a story and he’d draw the picture? It’s my turn to “pick” and decided to see if he could “draw” the Twitter feed I use to share funny things grandma says. 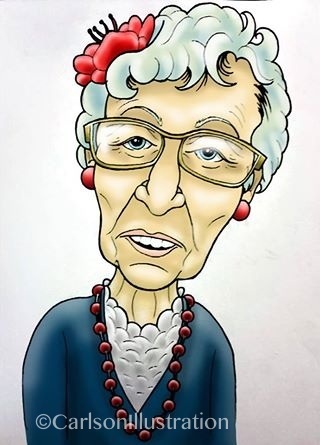 He sent me this drawing of Gram today. I’m floored. She needs more of a smile, and he’ll draw that next time but I can’t wait to see the picture when he draws some of the tweets. Can’t WAIT to see some of the awkward hilarity brought (back) to life. ← A walk. Two cookies. And beer.